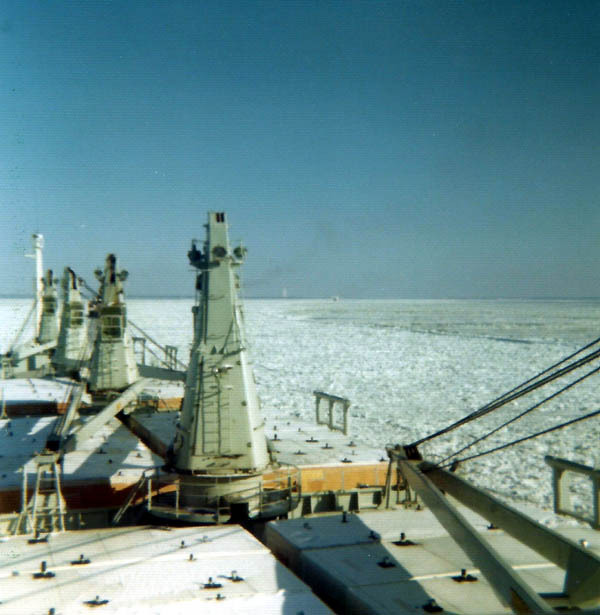 We were at anchor off Kawasaki about November 1978. I was the Engineer on watch as all the other Engineers and most of the Deck officers had taken a boat ashore. The skipper was Capt Murray with E Walmsley 1st Mate left on board. We started to drag the anchor, after much going ahead and then astern during which all the officers returned to the ship. What you see hanging was the result. It was an experience for me as I had just been promoted to Junior from Cadet, I remember Danny Trigg who was the C/E coming into the control room with a big grin on his face and saying I had better not have broken his engine. Great night. Michael Taylor. Posted on forum 4 November 2013. Photo on the left shows knotted anchor cable after dragging anchor off Kawasaki. Copywrite © Michael Taylor. Montreal 1975. 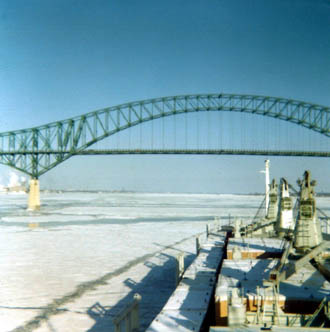 St Lawrence River Christmas 1975. St Lawrence River Christmas 1975. 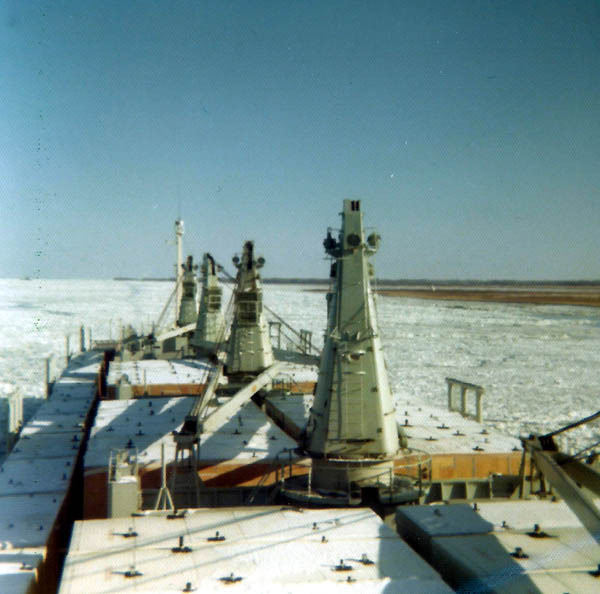 Trois Riviers - St Lawrence River 1975. 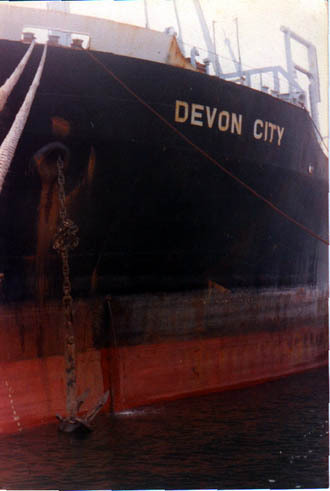 The Devon City initially loaded steel in Antwerp for Houston, but was diverted to Montreal to complete loading for the Persian Gulf. The Devon City docked at Montreal on the 6th December, and finally sailed on the morning of the 24th from a deserted port. The St Lawrence had iced over and initially progress down the river was okay, but just before noon the vessel became stuck for about 15 mins, before breaking free. The ice started to clear by Trois Riviers. 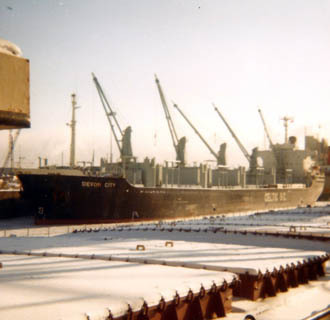 We cleared the St Lawrence on the morning of Christmas Day, stopping off Belle Island until late afternoon, whilst the deck cargo was properly secured. Needless to say Christmas Day was postponed until Boxing Day. Due to 'ice damage' the 'bite' of the propeller was increased, this led to the engine revs having to being lowered to decrease vibrations, but we still maintained a speed of 15kts. In the January edition of the Shipping Telegraph, the front page carried a photo of the last ship out of the St Lawrence on Christmas Eve, it depicted an orange tanker. If you looked closely at the picture, in the far distance you could see a ship and a cloud of black smoke and that was the Devon City. (Don't know if the smoke was just the boiler flashing up or engines going full power to free us from the ice). From the Devon City's point of view you can see the reverse. David Thomson. Copywrite © David Thomson.